I Survived a Weekend of No Running! While I didn’t go for a single run this weekend, my days were still pretty great! I started taking anti-inflammatories regularly after seeing the emergency clinic doctor on Saturday morning and have felt A LOT better since then. My hips still ache a bit if I sit for too long, but the burning has mostly gone away, and I even slept through the night on Saturday! 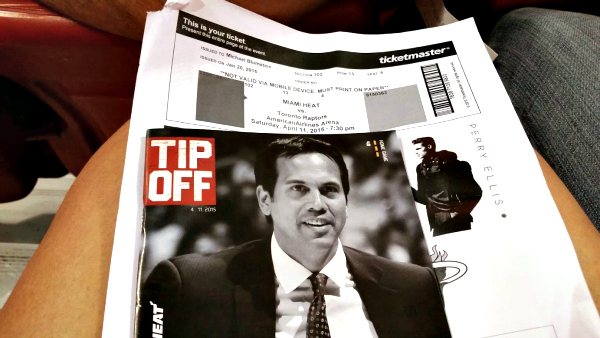 Saturday evening Adam and I headed down to Miami for the HEAT game! During the years that LeBron was here we would pay an arm and a leg to sit in sections 300-400 where the players look just marginally bigger than ants. Having seats just feet from the court was amazing! I got a good in-person look at Goran Dragić and I didn’t hate what I saw ;). 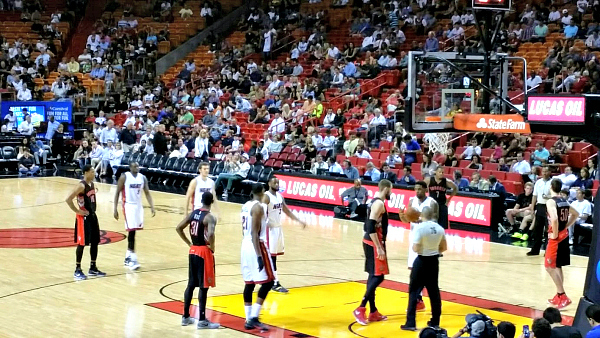 The HEAT lost in what was a pretty tragic ending to an otherwise good game. We’re now all but eliminated from the playoffs – but I’m still happy to have gotten to one last game before the season ends. After such an amazing four year run with the Big 3 it’s weird to not be saving my pennies for playoff tickets, but what can you do? We’ll come back stronger next year when Bosh and McRoberts are healthy again! I am working hard towards my goal of being able to do an unassisted pull-up! It’s gonna happen guys! Since I’m not able to put all of my energy into running right now, I’m focusing in on some important core/strength goals! 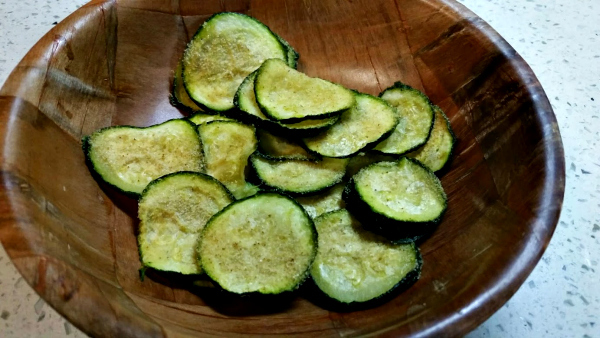 After the gym I decided to try a new snack recipe – zucchini chips! These are the simplest and tastiest snack. Thinly slice your zucchini and lay out on a pan, spritz some olive oil or canola oil on the chips and shake on your favorite seasonings. I used onion and garlic powder. Bake for an hour (or a little longer) at 230*F and you’ll have yourself a nice little batch of chips. I filled a whole cookie sheet sized pan expecting to have enough to share, but sadly it turns out there was only enough for me ;). If you’re less selfish you might find you can spare a chip or two for someone else. The chips aren’t exactly crunchy like potato chips but they taste so good you won’t mind! I’m not sure who to credit the recipe to as I think zucchini chips are like chocolate chip cookies – the recipe has been around forever and everyone has their own version, but I got the idea from here. Since we’ll be leaving him for a few days to go on vacation (why can’t cats go on cruises?!) we bought him a bunch of new toys. He’s used to Adam working from home and spending all day with him so when we leave he gets pretty bad separation anxiety. Hopefully the new toys will keep him occupied and he won’t even realize we’re gone! Just a couple more days of work to go before we sail! How was your weekend? Were you able to get in any outdoor activities? We got to go to a Nuggets game this weekend, too! So fun and that is funny you said that about football. I had that thought yesterday during the game. I do also enjoy baseball but it’s such a LONG season. Football is my favorite so even though it’s bittersweet when it starts (means summer is coming to an end) it is my favorite sport to watch so ultimately, I am happy!! Take care and looking forward to your next update and hoping it will include some running!! I thought about you when I saw the Nuggets score scroll across the bottom of my TV yesterday. Congrats on the win! Oh gosh, I can’t do an unassisted pull-up to save my life! It was always devastating in physical education growing up because I was really good at all of the other tests except that one. Haha I know what you mean! I totally remember just kind of jumping for the pull-up and then moving on to the next thing. They are so tough but I know with dedication and consistency I will get there this year. I’ve been working on it for a few weeks now and I’m making progress! The cruise sounds like it is going to be gloooorious! I was able to sneak in a few outdoor runs this weekend which was lovely after taking some time off for my foot. TIme off = necessary. When you come back it is THAT much better. I am so glad to hear that your runs went really well after a little time off. I completely agree that after a marathon you HAVE to take time off. I remember about 72 hours after Portland my mind was ready to run again but I made my body stay put for a few more days! That b’ball game looked fun! (the flames, however, make me nervous!) I was just thinking about football season last night as Hunter and I were watching the Red Sox being crushed by the Yankees (ouch!). Baseball is just so–slow. Seriously, I can get up, get a snack, putz around, change the laundry…and it is still the same inning! Have you ever watched the Tour de France (3 weeks in July). It is pretty incredible to watch. Once you get involved in all the strategy, it’s really interesting. The doping thing has tainted it, but I do believe they are trying to clean it up. 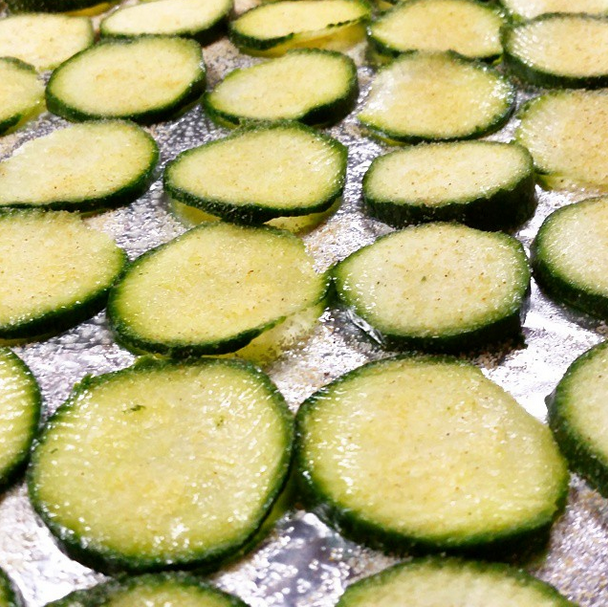 I have a lot of zucchini in the fridge from our veggie delivery–I am definitely going to make those chips! Haha the flames only last a few seconds. They blow them right at the beginning when they announce the lineup and then that’s it. I do enjoy watching the Tour de France! I usually don’t watch it super closely but I definitely keep up with it. I find all of the endurance sports so inspirational/motivational (even with the doping). Yaa! Good to hear the meds are working and you slept with out pain! That’s a great improvement 🙂 You look so pretty all dressed up for the game. Go get that pull up! I am still working on being able to do an unassisted pull up- i have been at this for months! It’s hard! Do you have an assisted pull up machine at your gym? My last gym didn’t have one so I gave up on it for a long time, I’ve just been getting back on the pull-up wagon the last few weeks. I’m so happy to hear that you’re starting to feel better already. Please update us with the clarification about the sand, because that would be good to know more about. 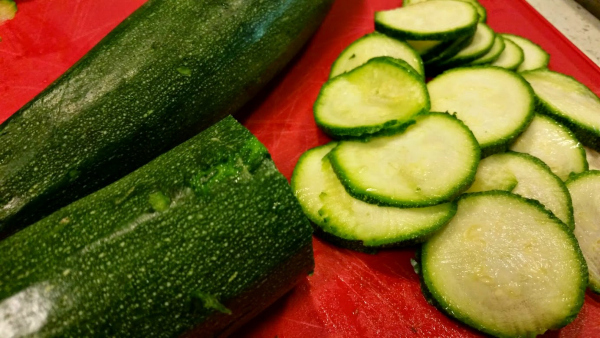 I LOVE zucchini and I think I’m going to plant some in my garden when I get home, so thank you for sharing the recipe for zucchini chips. I’m always happy to have another way to eat one of my favorite veggies. I am waiting for the doctor to call me back! I left a message at the clinic this morning asking for a follow-up. I hope to blog about it tomorrow! I love zucchini too, it’s definitely my favorite. I found an awesome “zucchini fries” recipe that I need to blog about. I’m going to make this sometime this week! I love your strength goals. You are so freaking strong already. How do you lean back with 50lb dumbbells onto a bench without killing yourself?????? I almost kill myself every time I do 30s. OMG I don’t lean back with 50lb dumbbells! I lean back with the 25lb dumbbells for a total of 50, and even with those I have to loop my feet under the little bar attached to the seat so I can control the speed at which I fall back onto the chair haha. Ooh that is a REALLY good idea! I should nose around Planet Fitness and see if they have benches like they. I seriously almost broke my hip bone once when I tried to sit up once from chest press. I wish Paul would come to the gym and hand me the dumbbells while I wore a tiara. THREE! That’s awesome, congrats! I’ve been diligently working on the reducing the weight I use for assisted pull-ups. I hope I’ll be able to do at least one unassisted one by the winter! The chips are really good! I wish you didn’t have to bake them for an hour though. They go so quickly for someone that takes so long to make! That’s my only complaint. Ok I am reading your posts in reverse – how scary! Aww hope you are feeling better. 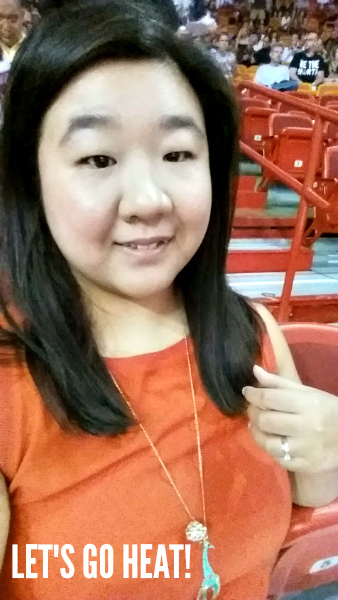 Loved your pic from the heat game – nice shirt and hair! It is always nice to see us runners in non running clothes and blown out hair. Ooooooh your cruise sounds like it’s going to be so great! I’m going on one in August and I can’t wait! I love going to basketball games even though I really don’t know anything about basketball. I agree with Cheryl though, those flames make me nervous! That’s so exciting! Where are you cruising to? I found that it was SO hard to balance strength training with marathon training. Last summer I was lucky to get in one strength day a week, and it was always upper body since my lower body needed the day of rest. When you’re putting in so much time and effort into running it’s hard to think seriously about any other type of workout! When we go on long trips (5+ days) we’ll have a family member come and stay with him full time – usually my dad since he’s retired. 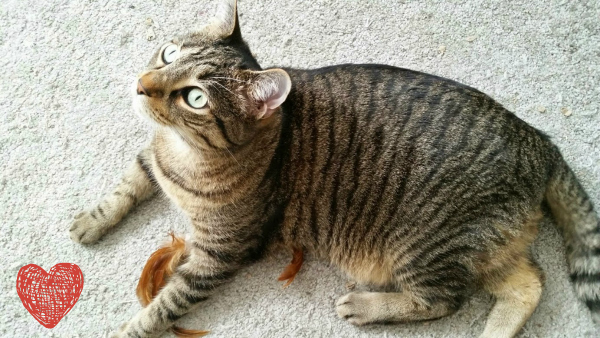 For shorter trips we use this really awesome cat sitter. I found her randomly through a Google search. She had a lot of positive reviews and came over to meet us and bond with Cecil before we left. While we’re gone she comes once a day to play with Cecil and to give him a can of wet food and treats. We’ve never boarded him; I think that would scare him too much. I’d rather leave him in his normal environment. It’s definitely a nice change up! For the zoodles you have to play around with different proteins and sauces! Do you follow https://instagram.com/inspiralized? Glad that after your week off you are feeling better!!! 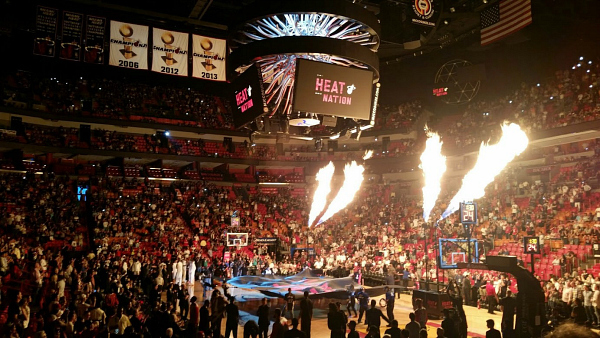 So cool that y’all went to the Heat game and had such great seats – I haven’t been to a pro basketball game but think it would be fun. Those zucchini chips sound good, I’m going to have to make some! I know getting answers from your doc was such a relief…not running for a weekend feels weird, but you kept busy, so that’s good! I’m glad you’re already noticing a bit of a difference. 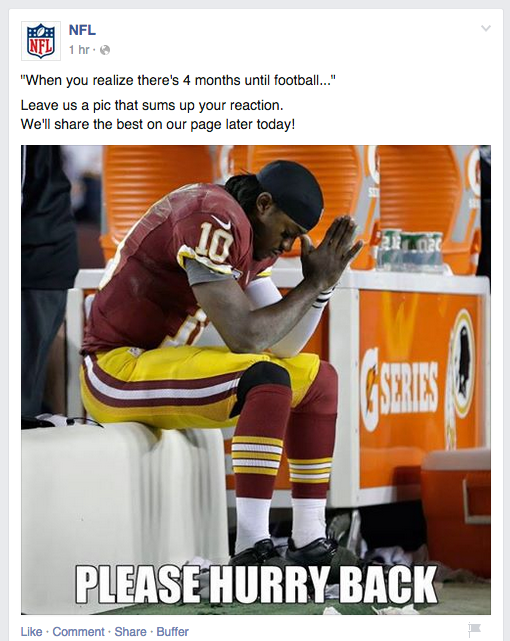 You’ll be back at it in no time!